A few weeks back I had a discussion with Maish Saidel-Keesing and Jason Boche on twitter about whether or not a user can be part of multiple vCloud organizations, and the answer is yes. Maish followed up with the question of whether it was possible to have users access a single URL and be forwarded to their correct organization URL. The answer of course is yes and I suggested one could build a simple intranet/webapp utilizing the vCloud API to query for a given user and to dynamically generate the organization URLs for that user. 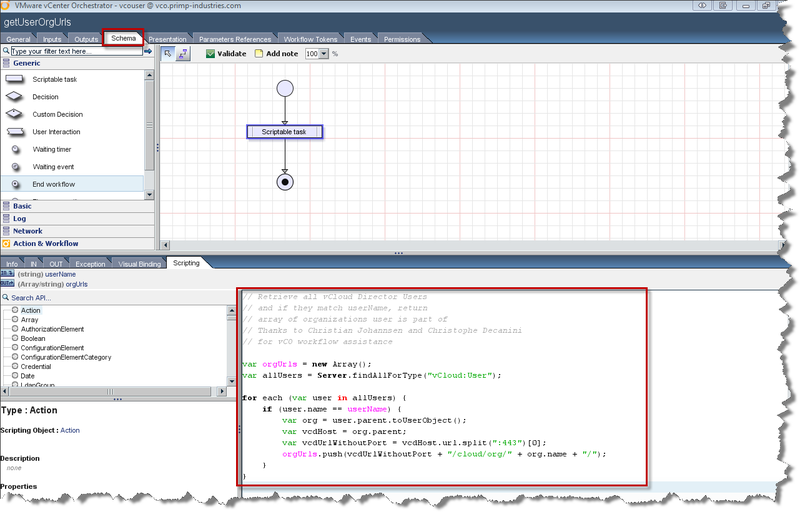 I thought that was the end of that conversation until a little later in the day when I noticed an interesting blog post vCO - wavemaker, your cloud webservice (part I) by Christian Johannsen showing how to create a simple web application using VMware's recent acquisition of Wavemaker and vCenter Orchestrator. A little light bulb went off and my curiosity got the best of me giving me an idea. 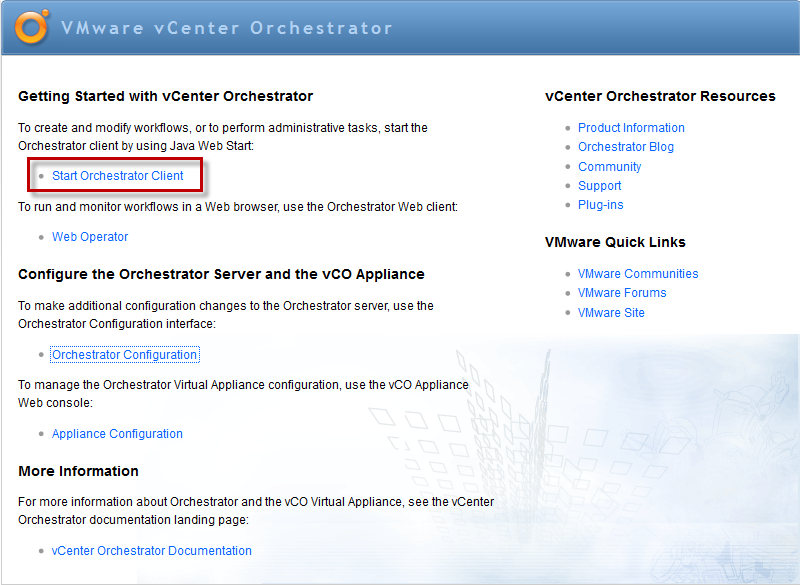 I wanted to see if it was possible to leverage vCenter Orchestrator, the new vCloud Director plugin for vCO and Wavemaker to create a simple web application that would solve the above use case. 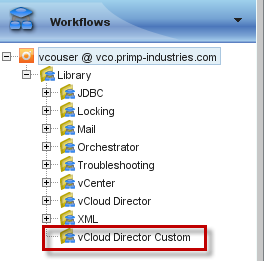 In this first of two part post, I will first demonstrate how to create a vCO workflow using the new vCloud Director plugin. If you can not wait, go to the bottom of this post to check out video of the final results. Here is an example of my vCloud Director lab setup in which there are multiple organizations with multiple users in each organization. 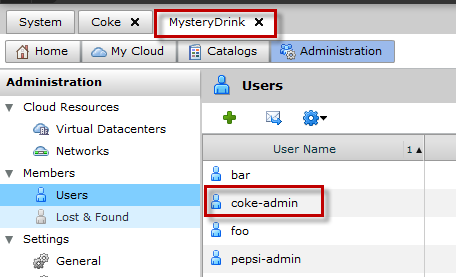 As you can see, we show that "coke-admin" user is part of multiple organizations "Coke" and "MysterDrink". 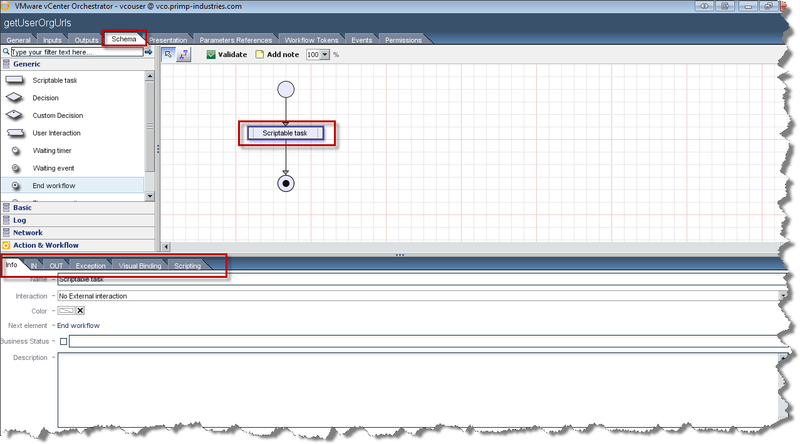 Next let's take a look at our vCO server and configuration (I'm using the vCO virtual appliance). 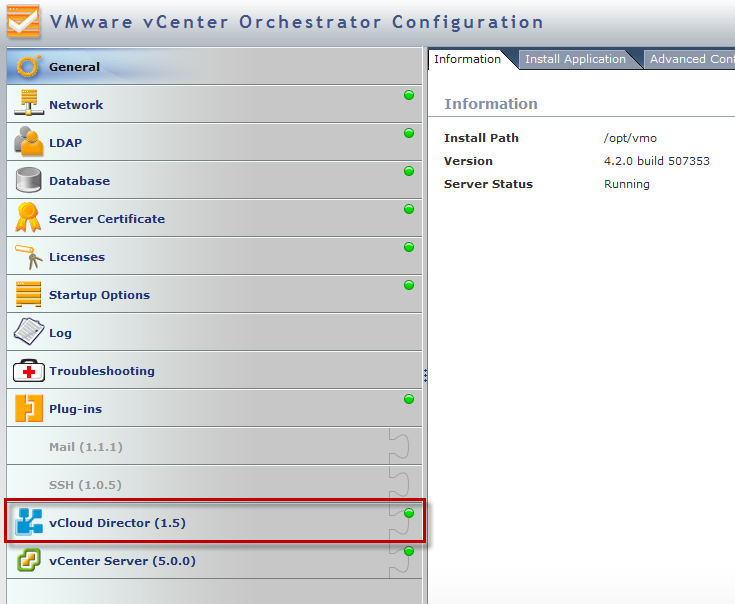 I will assume you have installed and configured the new vCloud Director plugin for vCO. If not, take a look at here for the documentation. 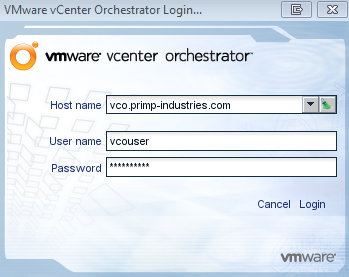 Now let's launch the vCO Client, you can access this by just pointing your browser to your vCO Server if you are using the vCO virtual appliance and clicking on "Start Orchestrator Client". You will now login to your vCO Server using either the default credentials or an account you created within your director services (AD,LDAP). 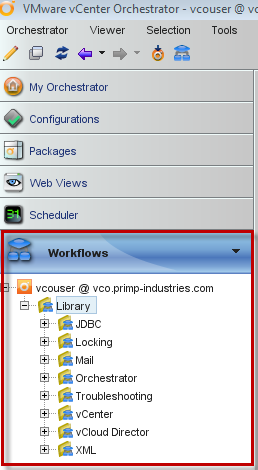 To verify that the vCloud Director plugin for vCO was configured correctly, click on the "Inventory" tab on the left and you should be able to expand out your vCloud Director inventory. Now you are ready to create your workflow, click on the "Workflows" tab on the left. Create a new directory to help organize your custom workflows. Right click on Library to create a new director. 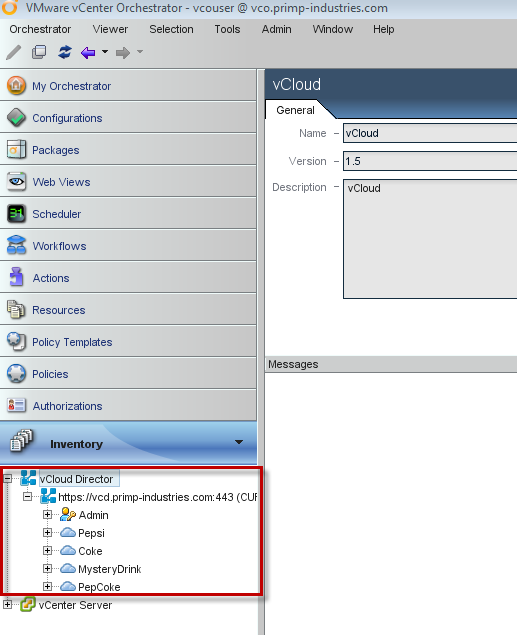 In this example I am calling it "vCloud Director Custom". 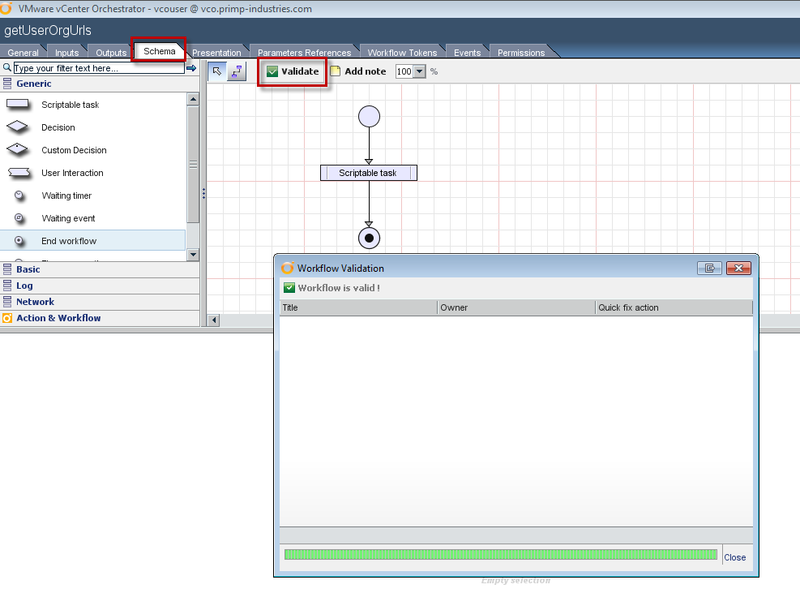 Next, right click on the director that was just created and create a new workflow. In this example I am calling it "getUserOrgUrls". Right click on the new workflow that was just created and click on "Edit" which will allow us to start creating our workflow. Let's define our input parameter which will be the name of the user inquiring about the organizations he/she is part of. Click on the orange button to create a new input variable, the type will be "string" and in this example I named the variable "userName" which will be used a little bit later in the workflow creation. Let's define our output parameter which will be a list of organizations URLs the user is part of. Click on the green button to create a new output variable, the type will be "array/string" and in this example I named the variable "OrgUrls" which will also be used later in the workflow. 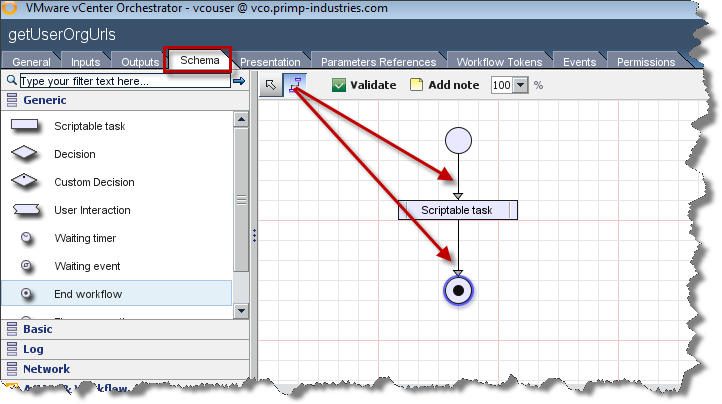 Next click on "Schema" tab and add a "Scriptable Task" and "End workflow" element to the workflow. 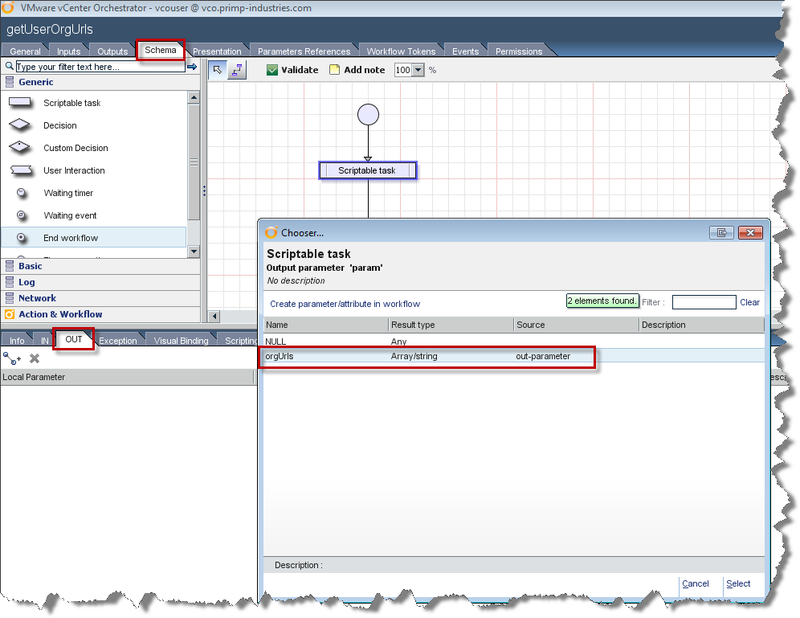 Then click on the Connector Tool next to the Validate button and connect the starting element to "Scriptable task" and to "End workflow" element. Now we will create a simple vCO script to actually perform the query of the "userName" and return a list of "orgUrls". 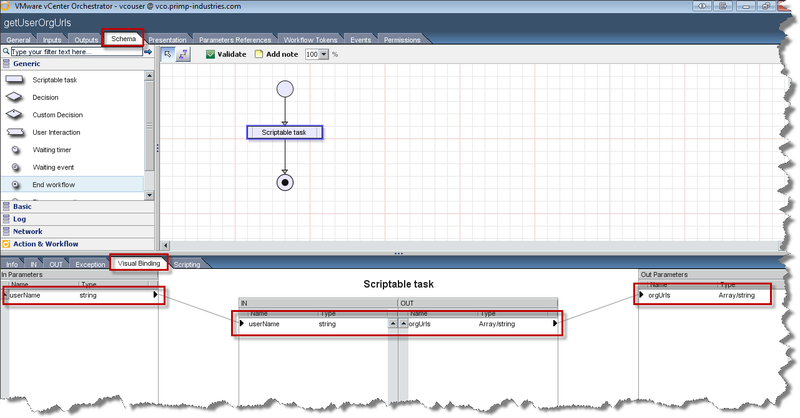 Click on the "Scriptable task" element and you should see a new screen load at the bottom like the following. Next we will bind our input variable, click on the on the icon next to the X and select "userName" variable which we created earlier. Next will bind our output variable, click on the on the icon next to the X and select "orgUrls" variable which we created earlier. To verify that both your input and output variables were binded, correct, you can click on the "Visual Binding" tab and it should look like the following. Lastly, we will insert our vCO script. 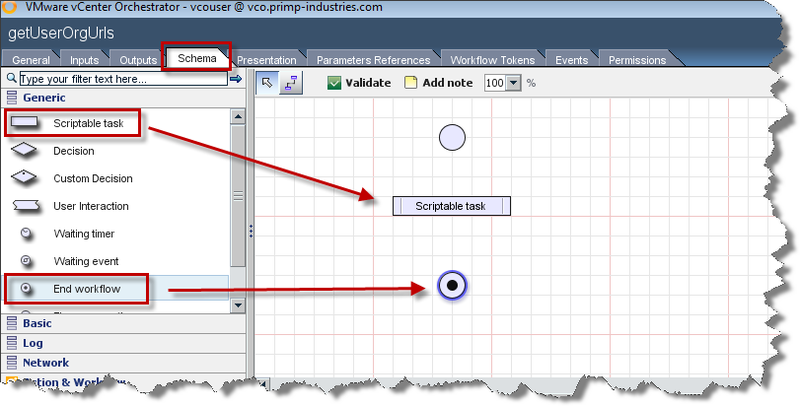 Click on "Scripting" tab and insert the following snippet. I would like to thank both Christian Johannsen and Christophe Decanini for their assistance on the vCO script. These guys are rock stars when it comes to vCO and you should definitely follow them on twitter if you are not already. Next we will validate the script to ensure all input/output parameters were used correctly and we do not have any known syntax errors in the script. Click on the "Validate" button at the top and you should get no warnings/errors. Leveraging vCD + vCO + Wavemaker Part 1 from lamw on Vimeo. 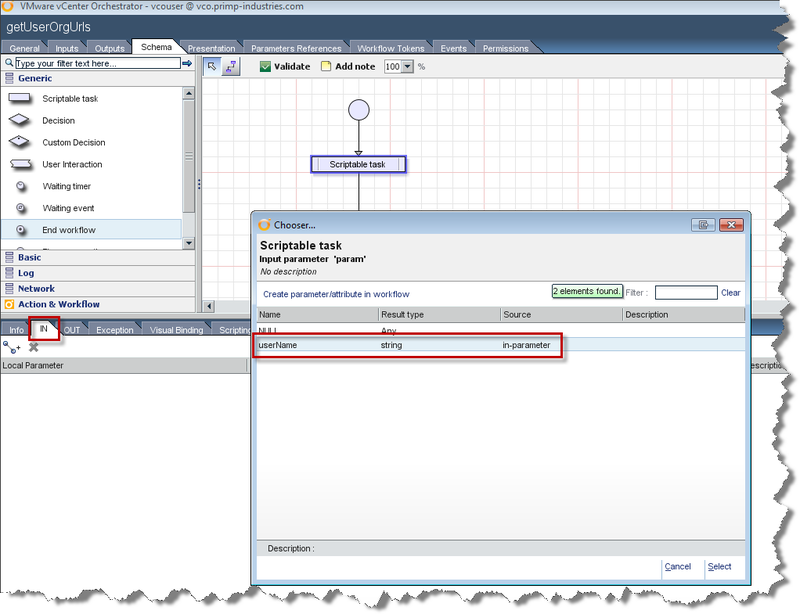 As you can see, we can easily leverage vCO and the new vCloud Director plugin to perform a variety of tasks not only limited to orchestrated-based operations but even simple queries as well. In my next post, I will show you how to integrate this with Wavemaker to present a simple web application for end users to consume. Stay tuned!